Do you use administrate? Leave a review! A framework for creating flexible, powerful admin dashboards in Rails. Try the demo. Administrate is still pre-1.0, and there may be occasional breaking changes to the API. Check the release notes for important updates. Administrate is a library for Rails apps that automatically generates admin dashboards. Administrate's admin dashboards give non-technical users clean interfaces that allow them to create, edit, search, and delete records for any model in the application. 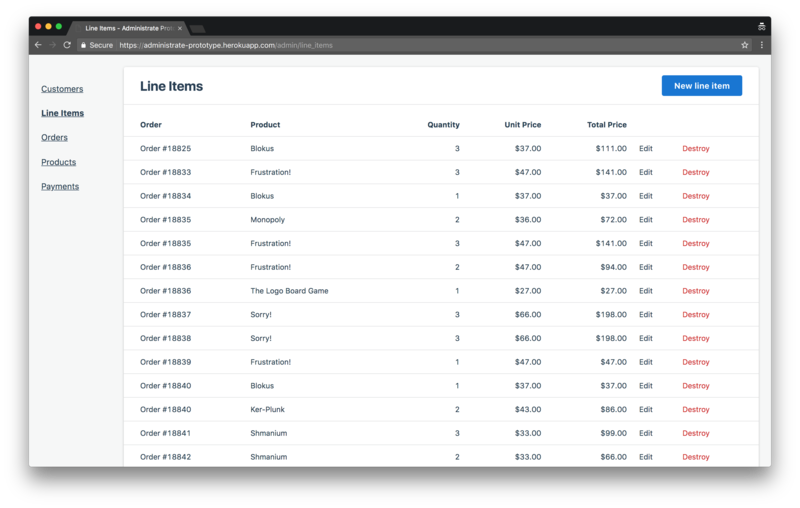 Administrate solves the same problem as Rails Admin and ActiveAdmin, but aims to provide a better user experience for site admins, and to be easier for developers to customize. Support the simplest use cases, and let the user override defaults with standard tools such as plain Rails controllers and views. Administrate supports Rails from 4.2, up to 5.0 and beyond. We support Ruby 2.2.9 and up. Restart your server, and visit http://localhost:3000/admin to see your new dashboard in action. For more detailed instructions or to make it work with Rails API-only applications, please go through the 'Getting Started` guide. In order to create additional dashboards, pass in the resource name to the dashboard generator. A dashboard and controller will be created. To customize the appearance, behavior, and contents of the dashboard, see the guides at https://administrate-prototype.herokuapp.com. These guides are available as markdown files in the docs subdirectory of the git repository, too. This repository contains both the source code for Administrate, and a demo Rails app that uses Administrate. The demo app is hosted publicly on Heroku. The gem's source code lives in the app and lib subdirectories. The demo app is nested within spec/example_app. The guides as seen at https://administrate-prototype.herokuapp.com live as markdown files in the docs subdirectory. Rails configuration files have been changed to recognize the app in the new location, so running the server or deploying to Heroku works normally. px for borders, text shadows, etc. administrate was originally written by Grayson Wright and is now maintained by Nick Charlton. Many improvements and bugfixes were contributed by the open source community. administrate is Copyright 2015-2017 thoughtbot. It is free software, and may be redistributed under the terms specified in the LICENSE file. administrate is maintained and funded by thoughtbot, inc. The names and logos for thoughtbot are trademarks of thoughtbot, inc.
over 2 years Setting extra attributes on has_many join table? over 2 years Question: Does this gem allow adding children to parent object? over 2 years "datetimepicker" not showing / responding in datetime field. almost 3 years question: Can I hide dashboards from the left menu but keep them in as relationships? almost 3 years How do I customize various admin messages? almost 3 years How to pass current_user to Administrate::Field ? almost 3 years Question: Why aren't field options available to templates? almost 3 years Is it possible to display an association on a particular dashboard? Add extension point for custom styles. let routes generator indent all routes (#505). mention home of .md guides in README (#503). Updating has_many label to titleize as per other fields in form view. Abstract model classes should be skipped without warning. Allow specifying scope in with_options for a belongs_to field. Add missing multiplier option for number fields. Add support for referencing the resource from fields. Add support for changing form field labels. Add additional Rubies using Workflows. Show errors when has_many restrict_with_error. In Microsoft Windows, Can I administrate the Java Runtime Setting by script? How to administrate a sinopia server (private npm registry)? What is the "standard method" for administrate this Wordpress layout? How to administrate Strategy Pattern behaviors at runtime? Execute a command line on the command prompt needs `administrate privilege` even using "ranas"? How to span child process with administrative privileges from parent process with administrate privileges in C#? How to get the app account access token needed to administrate app album? Any foundation to administrate an Android open source application? Can SQL Server Express be used to effectively administrate a SQL Server Standard/Enterprise installation? [COMPAT] [#1098] Update all the dependent gems. [COMPAT] [#1099] Update shoulda-matchers from 2.8.0 to 3.1.2. [DOC] [#1081] Update Field::Polymorphic doc to include order option. [COMPAT] [#1095] Upgrade nokogiri to 1.8.2. [i18n] [#1094] Translate form error keys in French. [COMPAT] [#1079] Cast all search queries to text. [COMPAT] [#1077] Switch out squiggly-heredoc for Ruby 2.2 support. [COMPAT] [#1077] Add Ruby 2.2.9 to Circle and clarify support. [COMPAT] [#1075] Upgrade Circle CI Postgres to 10.1. [COMPAT] [#1032] Add additional Rubies to CI using Workflows. [COMPAT] [#1074] Upgrade to Ruby 2.5.0. [BUGFIX] [#1046] Fix wrong variable name in new_resource key. [i18n] [#1055] Singularize field name in HasMany index partial. [BUGFIX] [#1068] Only define Punditize if Pundit has been loaded. [COMPAT] [#1067] Include pundit in the Gemfiles. [i18n] [#1056] Don't pluralise New [resource] buttons. [i18n] [#1057] Translate form error keys in Catalan. [i18n] [#1054] Add missing keys to Catalan. [DOC] [#1040] Add a note about adding to Dashboards. [BUGFIX] [#1028] Fix of class_name option on has_one fields. [DOC] [#1052] Fix Typo in Changelog. [FEATURE] [#999] Order attributes by association if it exists. [DOC] [#1039] Merge both Field::BelongsTo options_with sections. [i18n] [#1041] Improve German translation of form.errors. [i18n] [#1004] Add form I18n keys to non-default locales. [i18n] [#1004] Add show-/new-/edit- _resource I18n keys non-default locales. [i18n] [#1004] Add and improve I18n for application templates. [FEATURE] [#971] Add authorization features and a Pundit mixin. [DOC] [#1031] Switch to Circle 2.0. [FEATURE] [#1009] Option for Date(Time) objects be in a timezone. [COMPAT] [#1027] Add hardcoded development secret_key_base. [FEATURE] [#1020] Add support for editing polymorphic fields. [FEATURE] [#956] Add namespace option to generators. [DOC] [#1018] Remove suggestion than rerunning install works. [COMPAT] [#1016] FactoryGirl is now FactoryBot. [FEATURE] [#992] Improve field generators. [DOC] [#1008] Adding instructions for getting started with API-only apps. [i18n] [#988] Adds Catalan locales. [FEATURE] [#1000] Add test coverage to ApplicationHelper#sort_order. [UI] [#987] Fix cell sort indicator positioning. [i18n] [#981] Add localization for Bosnian language. [BUGFIX] [#982] Update name of specification example. [DOC] [#980] Update copyright range. [DOC] [#976] Explain that installer requires models. [COMPAT] [#977] Update gems for CVE-2017-9050. [BUGFIX] [#967] Change const_get to constantize to fix undefined method. [DOC] [#972] Fix interpolation highlighting at documentation examples. [FEATURE] [#807] Add foreign key option to Fields. [FEATURE] [#939] Add order option for belongs_to field. [DOC] [#946] Document renaming dashboards. [DOC] [#942] Add IntelliJ-generated files to .gitignore. [DOC] [#940] Add instructions of how to disable some actions. [UI] [#933] Switch to thoughtbot hosted seed images. [FEATURE] [#934] Support for models with uncountable inflections. [BUGFIX] [#935] Move normalize.css out of vendor. [FEATURE] [#788] Allow resource to be accessed from field. [OPTIM] [#859] Remove dependency on remote images in tests. [BUGFIX] [#771] Handle case where Field::HasMany data is nil. [FEATURE] [#801] Add HasOne support as nested form. [FEATURE] [#926] Accepts string instead of symbol on order. [DOC] [#928] Fix partial name in view customization docs. [BUGFIX] [#927] Remove rails-controller-testing gem to fix specs with Rails 4.2. [BUGFIX] [#925] Silence ActiveRecord migration output during specs. [CHANGE} [#924] Replace dashboard_class method with a delegate. [BUGFIX] [#594] Fix Label Translation Lookup for has_many Collections. [CHANGE] [#914] Allow custom scope for dashboards. [CHANGE] [#916] Adds _stylesheet to the resources to be generated. [UI] [#554] Make it easier to override Sass variables. [FEATURE] [#910] Allow custom scope for dashboard resource. [FEATURE] [#871] Add support for namespaced models. [I18n] [#904] Improve Korean translation for search input. [I18n] [#902] Fixes to Dutch translation. [COMPAT] [#887] Update autoprefixer-rails >= 6.0. [UI] [#896] Make entire search bar clickable. [I18n] [#891] Add translation for search input. [UI] [#886] Fix aria-labelledby on tables. [UI] [#884] Add aria-sort attribute to table headers. [UI] [#882] Update normalize.css and change how we include it. [OPTIM] [#898] Retroactively set migration versions. [FEATURE] [#856] Allow Rails 5.1 usage. [DOC] [#885] Update and test documentation navigation. [UI] [#880] Use SVG symbol for icon system. [CHANGE] [#883] Nested collection links should honour routes. [UI] [#879] Remove unused SVG asset. [DOCS] [#877] Add appraisal and foreman commands to docs. [I18n] [#873] Add support for cyrillic search. [CHANGE] [#857] Abstract model classes should be skipped without warning. Keep up with changes to administrate! Would you tell us more about administrate?